Hello! I have a quick project inspired by my little sister, Julie, to share with you. 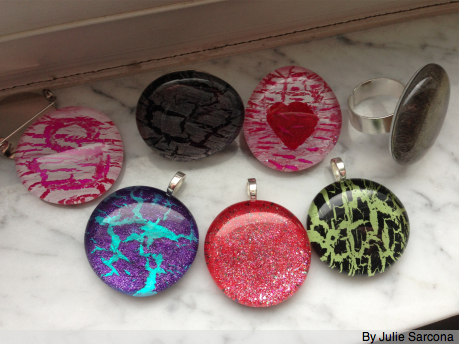 We had a rare opportunity to craft together recently and she showed me and my girls how to make these fun and super-sized pendants, pins and rings using glass stones, nail polish and jewelry findings. (Julie made all the pieces above.) Fun times like these make me wish we didn’t have 2.5 hours of drive time between us. Read on to make your own bling. These make great gifts for kids to make for their moms, teachers and friends. 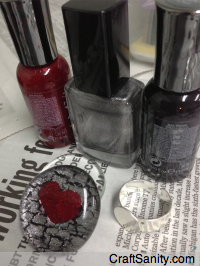 Step 1: Cover the flat side of the stone with a base coat of clear nail polish. (All your painting will be on the flat side of the stone.) Let dry. Step 2: If you want to create a random effect, apply a coat of “krackle” polish to the flat side of the stone and watch it appear to crack as it dries. Then apply a coat of regular polish in a contrasting color to create an interesting two tone effect. Or, for a more more festive V-Day theme, paint a heart motif in the middle of the flat side of the stone. Let dry. Then apply a background color. Step 3: Apply one more coat of clear nail polish to seal your design. Step 4: Glue the painted side of your stone to the ring base, pendant or pin back and set aside to dry overnight. Step 5: Sport your handmade bling around town and then get together with friends to make more. Thanks for sharing this fun craft idea, Julie! Dear readers, what Valentine’s Day crafts are you making this year? Please share ideas in the comments below. I need a newer tire! Another week wait and what I got was a second tire from the same old batch of tires. So psised off I left the store with the tire and receipt so i could report them on this and the store manager came out and stole the tire from the back of my vehicle as I was leaving. The police were called and this will most likely end up in court. I would love to see the day when the United States leaves the UN and is no longer a part of NATO; a day when all of our soldiers come home and our overseas bases are closed. Not a single drop of American blood should be spilt in defense of another nation. Only without entangling alliances can America ever trade freely with other nations. parabeens por todas essas conquistas, graÃ§as ela hoje sou profissional,atraveis de cursos e capacitaÃ§oes que fiz nesta ong.tambem gosto muito de politicas publicas e estou socia de uma associÃ§ao das muleres lutando por esses direitos… iguadade social. Danke! FÃ¼r die GlÃ¼ckwÃ¼nsche, aber in erster Linie fÃ¼r diese absolut auÃŸergewÃ¶hnlichen Fotos.Wir hatten GlÃ¼ck mit unserem Hochzeitsfotografen und das bekommen wir auch von allen Seiten bestÃ¤tigt.